This cloth is women's vintage new plaids spring autumn blouse with two front pockets. 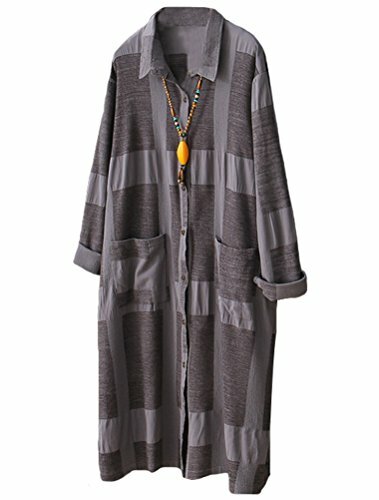 Unique design, this blouse/dress/tops/cardigan/shirt/coat makes you more attractive, charming, fashion and elegant. The fabric Minibee use for this loose tunic is cozy cotton, which is SUPER SOFT breathy and durable fabric. Size M:Bust:110cm//43.3", Shoulder:43cm//16.9", Length:101cm//39.8", Sleeve:57cm//22.4", Cuff:27cm//10.6", Sleeve Cir:38cm//15"
Size L:Bust:116cm//45.7", Shoulder:44cm//17.3", Length:102cm//40.2", Sleeve:58cm//22.8", Cuff:28cm//11", Sleeve Cir:40cm//15.7"
Size XL:Bust:122cm//48.0", Shoulder:45cm//17.7", Length:103cm//40.6", Sleeve:59cm//23.2", Cuff:29cm//11.4", Sleeve Cir:42cm//16.5"
Size 2XL:Bust:130cm//51.2", Shoulder:46cm//18.1", Length:103cm//40.6", Sleeve:60cm//23.6", Cuff:30cm//11.8", Sleeve Cir:44cm//17.3"
It is very comfortable to touch and wear, cotton linen blouses makes you more attractive, charming, fashion and elegant. Occasion: Casual, Holiday, Vocation, Evening, Party, School, Homing.